Choosing the best salmon rod and reel combo for your needs can be hard. There are so many different setups, techniques, and habitats it can be overwhelming. In this article, we will explore the uses of and for salmon fishing combinations. People typically fresh for salmon in both saltwater and freshwater. However, the methods are different. Let’s take a look at the 3 different types of salmon fishing: boat, shore, and freshwater. Boat: The first method of salmon fishing is by boat. This requires a rod reel combo that is resistant to the corrosive power of saltwater. Additionally, boats require regular maintenance, so take all costs into consideration before buying one. From a boat, the most common ways to fish are drifting and trolling. Both of these require tackle that won’t get caught in seaweed or other ocean grass. At the same time, you must balance the weight to reach deep enough to catch salmon. Shore: Salmon fishing from shore also requires a rod and reel combo that won’t corrode in the sea water. For this method, you don’t need to be as concerned about kelp gunking your line. Instead, casting far enough out is a main priority. We recommend bottom bouncers and a packed roe bait if you plan on fishing from shore. You can also use crawfish. Check out this video from salmon pros Scott and Tiffany Haugen on fishing from land. Freshwater: Freshwater salmon fishing makes use of floats as the primary way of catching fish. However, you can also fly fish in rivers and during runs. The final freshwater method is bottom bouncing and it involves almost constant casting. In this article, we will focus on rod and reel combos that use floats. Bottom bouncing is not widely approved of in angler circles, and fly fishing needs its own article! If you are already a bottom bouncer, refrain from using lead. The Washington Department of Fish and Wildlife has prepared an in-depth guide on freshwater salmon fishing. If you are new to the sport, this is an extremely informative jumping off point. 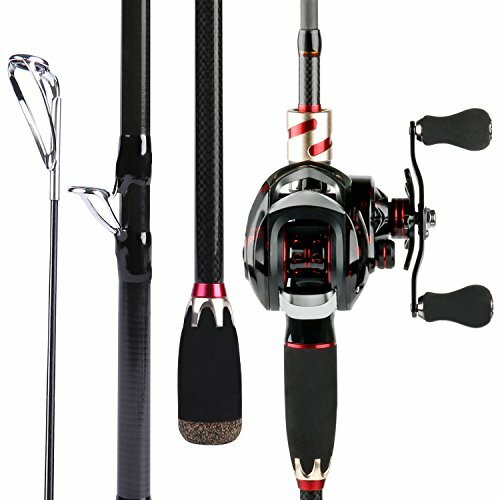 What are the Qualifications for the Best Salmon Rod and Reel Combo? Boat: If you plan to troll, a good salmon fishing rod should be around 7 feet. It should also be strong. How strong? Salmon in the Pacific Northwest can grow to over 50 pounds! The sacrificed sensitivity is fine since these fish don’t nibble. They bite! The rod should also be lightweight and flexible enough to fight your fish. Rods that weigh more have their benefits, but you don’t want your arms to be too tired to win the final battle. The best action is a heavier action. Shore: Both shore and boat salmon fishing rods should be saltwater resistant. However, that is no excuse for not cleaning your combo after each trip out. The power of anti-corrosive materials and good care will keep your rod strong and healthy. Since you will be casting, you want a lighter and longer rod. Keep in mind you could be catching salmon ranging into the 20-pound range, so you also want your rod to be strong. That means heavier action. Freshwater: When salmon fishing in freshwater, you should purchase a rod that is easy to cast. It should also be strong enough to hold a large salmon. Keep in mind lures or blades are good for getting bites. Steelheads. Steelheads do nibble, so you want your float to sink at the tiniest movement. Here’s a how-to guide from the Oregon Department of Fish and Wildlife. What are the Qualifications for a Good Salmon Fishing Reel? If you want to troll, you need a strong reel. The trolling gear is heavy, and the salmon you catch will be heavy, too! For drifting, the reel sill needs to be strong enough for battle. It doesn’t need to be as strong because it doesn’t undergo constant stress. When casting from shore, people typically use spinning or baitcasting reels. Anytime you plan on casting into saltwater, the reel should be resistant to saltwater corrosion. Freshwater reels, like shore reels, should be lightweight to aid with casting. Baitcasting reels are lighter than spinning reels, but they are best appreciated by advanced anglers. Spinning reels are the best for beginners and easiest to use. 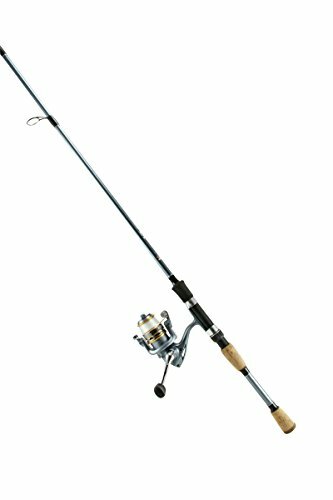 The Okuma ROX Spinning Combo is a great starter rod and reel for salmon fishing. The company even gives you the choice of 3 different lengths, all at medium action: 6 feet and 6 inches, 7 feet, and 8 feet. Go shorter for drifting and longer for casting or floating. Made of graphite composite, this spinning rod and reel are strong. They are also comfortable with EVA foam grips, and lightweight due to the use of neo-cork. Under all of this comfort, the handle is made of aluminum. This allows you to put up a better fight with the salmon! The Okuma Rox Combo can come apart in 2 pieces, so keep that in mind if you travel for your salmon fishing. The gear ratios of each reel are as follows: 5:1:1 on the 6-foot and 8-foot combos, and 5:0:1 on the 7-foot combo. These are great combos for trolling up to 20 pounders! Of the 5 best salmon rod and reel combos, the Sougayilang Crown Rod and Reel Combos get the title of editor’s choice. The 7-foot rod is made of carbon fibre and comes apart in 4 sections for easy travel. The whole thing is lightweight so you can carry it anywhere in a backpack. The reel was created for comfort with an ergonomic design, and the EVA handle makes for all-day comfort. The reel seat is made of graphite, and the reel itself is high-quality carbon fibre. 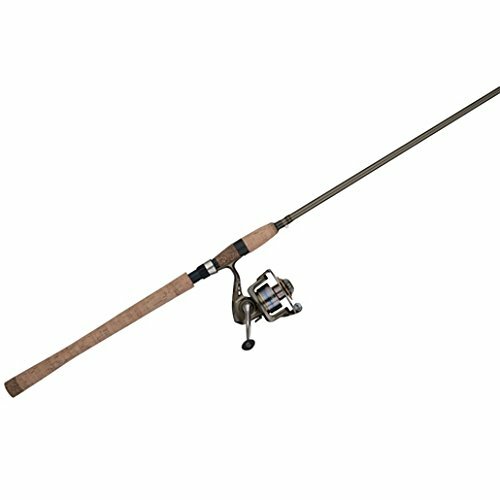 Overall, this Crown Rod and Reel Combo is strong enough to handle up to 25 pounds of fish! This Sougayilang medium action baitcaster is perfect for more advanced anglers. The amount of ball bearings is 17+1, a good number for those more experienced with salmon fishing techniques. The gear ratio is 7:2:1, and you can add up to 18 pounds of drag for trolling. The Shakespeare UglyStik Elite was designed specifically for use with Steelheads and other salmon. This combo is a spinner, so it is easier to use than baitcasters. It is also smoother, using 4 ball bearings and instant anti-reverse technology. In terms of construction quality, the UglyStik Elite is strong. It is made from graphite and fiberglass to offer you the best of both worlds. You get a rod that is still sensitive, which is important when waiting for the nibble of a Steelhead. You also get a rod that is lightweight! The handle is on this Shakespeare is made of aluminum for extra strength where it matters the most. The rod itself is a full 9-feet long. This is great for those of you who want to cast farther. Even though the Elite comes in 2 pieces, the guides are all 1-piece stainless steel. The Shakespeare Wild Series is our favorite of the 5 best salmon rod and reel combos to use for freshwater casting. Why? The medium-light action allows for further casting, as does the lightweight 9-foot long rod. It is also a spinning reel, so it is a nice one to learn freshwater on. The rod is made of IM-6 graphite, and it is strong enough to assist you in catching up to a 20-pound salmon. For bigger fish, just change out the reel. The bearing system on this Shakespeare is a 4+1, and the drag system feels smooth thanks to its carbon fibre construction. The tip on the Wild Series is ultra light, so you don’t have to worry about missing a Steelhead bite. There are even extra guides for accuracy! So, if you are thinking about float fishing or anything that involves casting on freshwater, seriously consider the Shakespeare Wild Series. 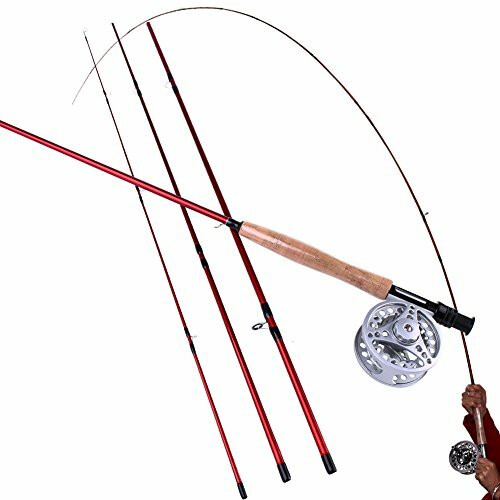 Our favorite fly fishing combo is the Sougayilang Fly Fishing Rod and Reel. If you are new to fly fishing and want to try your luck in the river, this combo is your best bet. It even comes in 4 separate pieces for those fisher-people who like to travel, hike in, or camp for days! The rod is 9 feet long and made out of IM-8 carbon fibre. It is strong, but it is a 5/6 Wt so we only recommend it for catching smaller salmon. The combo is also lightweight at 4 ounces, with a soft cork handle for added comfort and weight saving. The cast is very decent. No matter where you use this Sougayilang, the combo will be protected from all types of corrosion. Whether you are a lefty or a righty, you can change the reel hand in a few simple steps.